Play Dragon Pays online for free now! 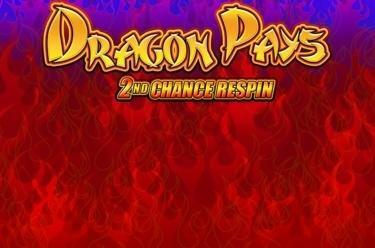 Dragon Pays is played on 5 reels that spread either over 243 win paths or up to 20 win lines. The most valuable symbols in the game are the Coin (Scatter) and the Money Pot. 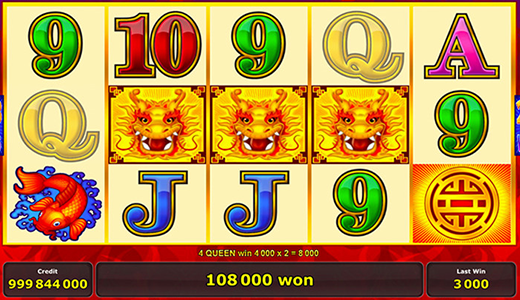 Your aim in Dragon Pays is to land a winning combination of 5 identical symbols along the win paths or win lines. Win paths and win lines run from left to right without interruption. The Dragon symbol can only appear on reels 2, 3 and 4 and acts as Wild symbol that substitutes for any other symbol except for the Coin (Scatter). As Scatter symbol the Coin pays winnings regardless of its position on the reels, provided that a combination of 3 Coins starting on the first reel without interruption is present. If you play with 20 win lines you can earn 15 free games with 3 or more Coins (Scatter) or at random at the end of a regular spin. In winning combinations with the Dragon symbol, a randomly selected x2 , x3 or x5 multiplier is applied. With 243 win paths you can choose the number of free games. A randomly selected multiplier is also present here that is applied if the Dragon is part of a winning combo. That way, up to 18 free games and a multiplier of up to x30 are available. If during free games with 243 win paths one or several Dragons are not part of a winning combo, the Second Chance Respin is triggered. Thereby, all reels with Dragon symbols are stopped and all remaining reels spun again. During this feature, the Dragon symbol spreads across all positions of the reel it has landed on. This dragon might be a little chubby, but we sure don't mind. It's all because the star of Dragon Pays is brimming with good fortune and great winning chances! How do you want to play? With up to 20 win lines or rather 243 win paths? The latter can increase the multiplier in the free games to up to x30. The Second Respin Feature also plays a role here, so don't hesitate! Become friends with the golden dragon and spin the reels!